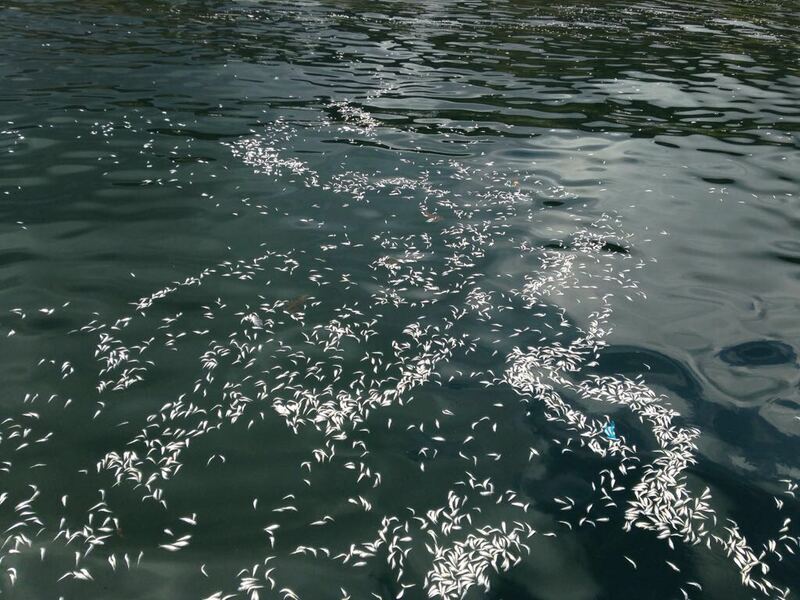 Thousands of small dead fish carpeted the water off Chaguaramas yesterday, leading to a call from Fishermen and Friends of the Sea (FFOS) for Energy Minister Franklin Khan to release all information on last month's oil spill. Photographs shared by FFOS showed the tide carrying a mass of the dead fish, which appeared to be of the sort used for bait, into the bay around Crew's Inn. FFOS general secretary Gary Aboud said the dead fish numbered in the thousands. He noted the oil spill at Petrotrin's Pointe-a-Pierre refinery, which affected wildlife around the Guaracara River and Gulf of Paria and which the company confirmed at the time was moving north-west. Recently 20,000 dead fish had washed ashore with maybe five times more are at the bottom of the sea, local fishermen blamed an oil spill and Corexit. But more crude oil has spilled into the already polluted Gulf of Paria after a Petrotrin discharge line from an oil to shore pump of Trinmar's Platform 17 developed a leak. It is uncertain how much crude oil spilled into the sea. A source said the oil spill occurred between Thursday night and Friday morning and was cleaned up within hours by Petrotrin personnel before it came to shore. The State-owned company did not issue an immediate public notice about the spill and it was only yesterday that the company acknowledged the leak when asked by the media.